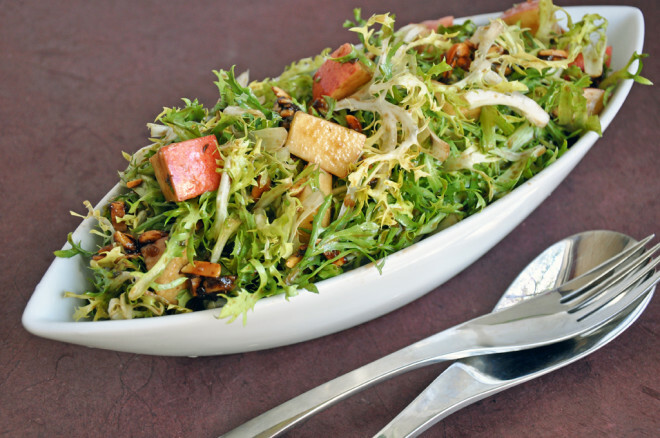 A perfect Thanksgiving salad to showcase fall produce. I just love any salad with nuts and fruit! This one pairs sweet, crisp Gala apples and homemade spiced almonds with a roasted garlic balsamic vinaigrette. Making salad dressing at home is a snap. Watch the video clip below to see just how easy it is. Feel free to substitute for your favorite apple, nut and/or vinegar. Cut the top off the garlic head, about 1/4" down, drizzle with 1 tsp EVOO and wrap tightly in foil. Roast in the oven for 50 minutes, remove and let cool. Meanwhile, toast the almonds in a dry skillet over medium heat for 4-5 minutes, until browned, but watch they don't burn. Add the butter and melt. Then add 1/4 tsp salt, cinnamon, cumin and cayenne and mix well. Add brown sugar and 1 Tbsp water and stir the mixture until thick about 2-3 minutes. 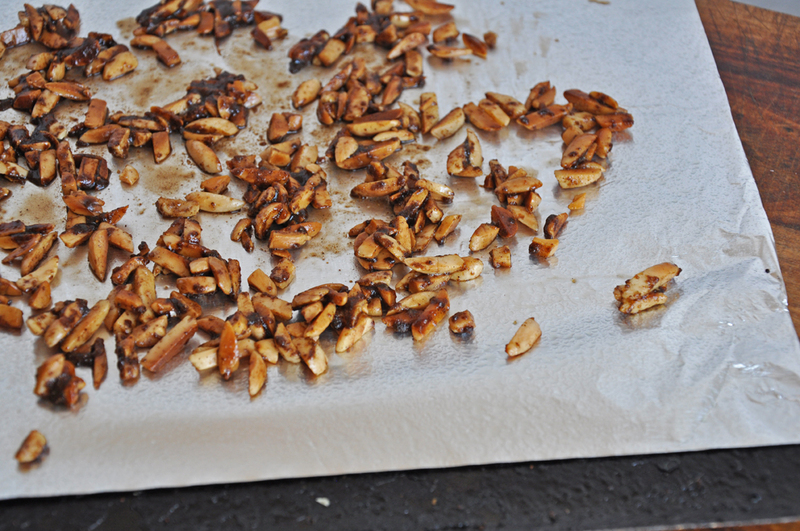 Remove from heat and spread nuts out onto a baking sheet to cool and harden. In a small bowl, whisk together the vinegar, mustard, sugar and remaining 1/2 tsp salt. Slowly drizzle in the 1/3 cup EVOO until the dressing is emulsified. Squeeze the garlic cloves from the head and chop. Add to the dressing along with the chives. Add the lettuce, apple chunks and nuts to a large bowl. Drizzle as much dressing on as you like and toss well. Serve immediately.